We will start with a walking tour of Point Pleasant Riverfront Park where floodwall murals depict scenes from the Battle of Points Pleasant and local history. Next, we will stop at Tu-Endie-Wei State Park. This four acre park commemorates the October 1774 Battle of Point Pleasant and houses the Mansion House, erected in 1796 as a tavern and now preserved as a museum with displays of antiques and heirlooms of the era. Then we will stop at The Point Pleasant River Museum which is dedicated to preservation of the heritage and way of life on the Ohio and Great Kanawha Rivers. After some downtown shopping time in the Twin River Area we take you to visit Fort Randolph inside Krodel Park. A one-time refuge for white settlers against Indian attacks, this fort was the farthest most out-post of the colonies and played a crucial role in the American Revolutionary War. After visiting Fort Randolph, cross the street to the Mothman Museum and learn the eerie Legends of Mothman that began in the 1960’s when sightings first began to haunt the town of Point Pleasant. Our journey begins on Green Street with several hometown eateries and a charming shopping district. Then, a stop at the Mounds; a sacred site of the ancient Great Mound, a major earthwork built between 800 BC and 700 AD by indigenous peoples of North America. Next, we will explore The Castle, with its octagonal tower and stone capped spires, The Castle of Marietta is one of the best examples of Gothic Revival style architecture in Ohio. Later we will explore the museums of the area; The Campus Martius Museum, a civilian fortification with collections preserving the history of America’s migration west, earliest native inhabitants and Marietta’s pioneers. 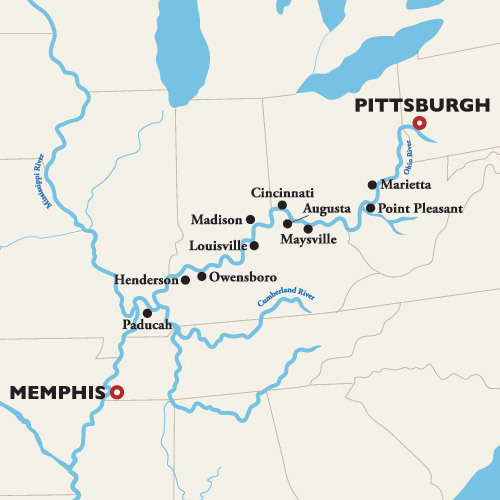 Discover the golden age of the steamboat and learn about the ecology of the Ohio River system at the Ohio River Museum. Next on the list is a stop at Historic Harmar Village, with its brick streets, lamp posts, restored train cars and historic buildings this picturesque small town is the quintessential example of small town America. Explore landmarks such as the Children’s Toy-and-Doll Museum and Marietta’s Cola Museum & Fountain Shop while exploring the quaint town. Guests can spend time in The Armory and enjoy the pubs, winery, and brewery places found along the way. Last stop will be at Post Street for shopping, art galleries, boutiques or museum visits. RACING ON THE RIVER - By any measure, the Ohio River is no mere tributary to the Mississippi, but a mighty river unto itself. On this new itinerary, you will embark on a cruise imbued with the heritage of small town America and the nostalgia of America's vibrant steamboating history. As you discover the charming attractions of quaint ports that have long been guest favorites, you will have the opportunity to take part in themed racing events such as a 5k run in Augusta, and experience the thrill of horse racing at the famed track at Churchill Downs in Louisville. But racing on the river just wouldn't seem right without the excitement of riverboat racing, so join us onboard as we challenge riverboats, such as the Belle of Louisville, for a good old-fashioned race on the river!